This free utility converts messages from the EML to HTML files. The EML file format is used by mail programs to store emails. Most email clients can save mail to EML files. However, to see the contents of the messages in the EML format (for example recipients, subject, or text) and open attachments, you must use additional programs. The easy way to view EML messages without having to install other programs is to convert them to HTML. After converting EML to HTML, you can view the emails in any web browser. For example, you can save these emails to a cloud-based drive and work with your email from any device anywhere in the world. This is a convenient way to back up your email messages. Converted HTML files will contain the sender's and recipients' addresses, subject and text of the message, as well as links to attachment files. If the original message was in the HTML format, the original formatting will persist. Attachment files will be saved to a separate folder next to each HTML file. 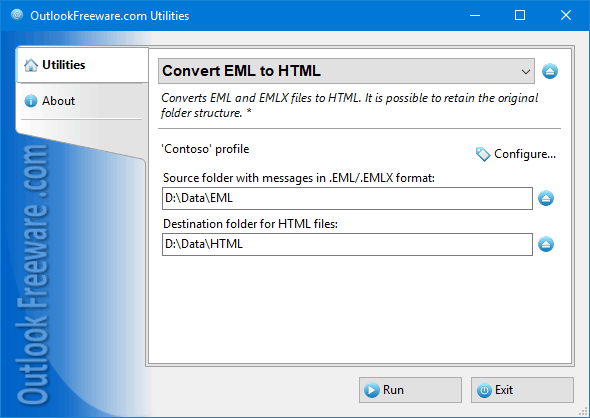 Key benefits of the utility: - Converts messages from EML to HTML files, preserving the original Outlook folder structure. - Saves attachments to a separate folder, including inline and hidden attachments. - Saves embedded messages and other Outlook items to MSG files. - Stores sender and recipient addresses from EML messages to HTML files. - Safely converts EML files to HTML format, renaming or skipping existing ones if necessary. - Contains a command line application to batch convert messages from EML to HTML. Use the command line application to run the tool in your batch files, scripts, and Windows Task Scheduler. These scenarios enable you to convert EML messages to HTML by a schedule, and also allow you to convert a large number of EML files from different locations with a complex folder structure. If you want to convert messages from Outlook rather than EML files, use our utility for exporting messages from Outlook to HTML.